Pictured at the presentation of a stained-glass photograph of the DAF XF & CF Series, as an acknowledgement of winning the International Truck of the Year 2018 is Nicky Gill, Sales Director, DAF Trucks Ireland and Tommy Smith, Managing Director, DAF Trucks Ireland along with Jarlath Sweeney, Group Editor, Fleet Transport, Irish Jury Member of the International Truck of the Year jury. 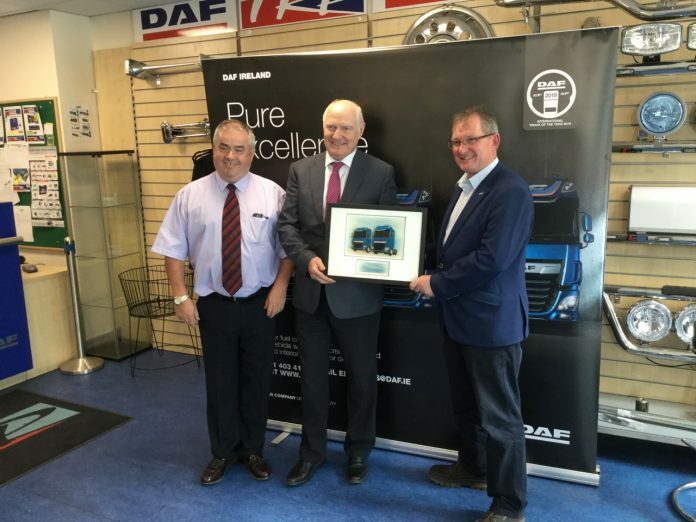 DAF Trucks’ CF and XF series were jointly voted ‘International Truck of the Year 2018’ by an independent jury of leading road-transport journalists from 23 European countries. It is the most prestigious award in the European truck industry. The DAF latest CF and XF feature completely new powertrains with highly efficient transmissions and rear axles. Together with the new compact after-treatment systems, sophisticated software and aerodynamic optimizations, these innovations result in a fuel efficiency gain and CO2 reduction of an impressive 7%. For vocational configurations of the new trucks there are up to 300 kilograms in weight reductions to further enhance the customer’s operating efficiency.